PLYMOUTH, Massachusetts, June 17, 2011 (ENS) – It took five years and $2 million to complete, but today the effort to restore the headwaters of Massachusetts’ Eel River and its wetlands paid off with an award from the Coastal America Partnership honoring the project’s success in protecting an important coastal ecosystem. In southeastern Massachusetts, the Eel River once flowed uninterrupted to the Atlantic Ocean through a wetland known as Finney’s Meadow. In the early 1800s, a series of mills and dams were constructed. Cranberry farming began in the late 1800s and continued until 2002. Agricultural activities resulted in land clearing, modification of the stream channel, construction of upland berms and water control structures. The downstream dam was a barrier to fish migration and the impoundment affected habitat, water quality and natural riverine processes. In 2005, the town of Plymouth purchased 39.5 acres of abandoned cranberry bogs that were part of the Wetland Reserve Program through the USDA’s Natural Resource Conservation Service. 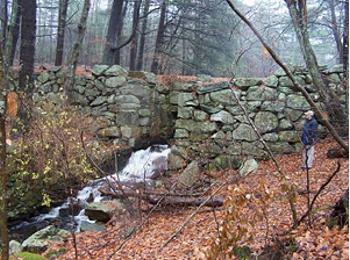 In 2006, the Community Preservation Committee of Plymouth, Massachusetts purchased surrounding forest, upland and cranberry bogs from the Phoenix Cranberry Corporation and converted the entire area to public conservation land. The restoration project included the naturalization of the abandoned cranberry bogs and the removal of Sawmill Pond Dam, located downstream of the bogs. The restoration site is inhabited by six endangered or threatened species including the Eastern box turtle, the bridle shiner, the barrens buckmoth, the adder’s tongue fern, swamp oats and the northern red bellied cooter. The natural stream channel was restored, artificial side channels were filled, berms and water control structures were removed, and undersized culverts were replaced to enhance fish passage. More than 24,000 plants, including 17,000 Atlantic white cedar trees, were planted. The project represents the first large-scale restoration of this rare wetland type in Massachusetts. Now known as the Eel River Preserve, the area is managed by the town of Plymouth for public use and benefit. The project resulted in the protection of fish and wildlife, increased the local environment’s resilience to climate change and enhanced public use of the conservation land. The Coastal America Partnership, a national organization of more than 16 federal and state agencies, recognized the collaborative efforts of the town of Plymouth, local environmental organizations and local companies, as well as federal and Massachusetts environmental agencies. Established in 1997, the Coastal America Awards program honors outstanding efforts and excellence in leadership for protecting, preserving and restoring the nation’s coastal resources and ecosystems. “Coastal ecosystems are among the Commonwealth’s most precious resources and the Eel River project demonstrates how the cooperation and innovation of partners – both public and private – can not only restore but revitalize these critical habitats,” said Massachusetts Energy and Environmental Affairs Secretary Richard K. Sullivan Jr.
“The Town of Plymouth is appreciative of the wonderful partnership that was developed between local, state and federal agencies to complete the Eel River Headwaters Restoration Project and looks forward to maintaining this partnership in the future to restore other wetlands and aquatic habitats in Plymouth,” said David Gould, environmental resource manager for the town of Plymouth. Project partners included: the town of Plymouth, the Massachusetts Department of Fish and Game and its Division of Ecological Restoration, Massachusetts Department of Environmental Protection, the U.S. Fish and Wildlife Service Partners for Wildlife, the U.S. Department of Agriculture Natural Resource Conservation Service, American Rivers, The Nature Conservancy, the Massachusetts Corporate Wetlands Restoration Partnership, the Horsley Witten Group, and the A.D. Makepeace Company. The site contractor is SumCo Eco-contracting of Salem, Massachusetts and design services were provided by Inter-fluve, Inc.